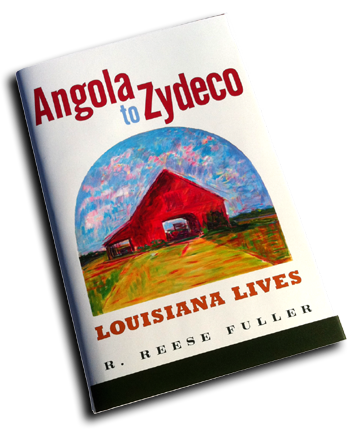 Order your signed copy of Angola to Zydeco: Louisiana Lives by R. Reese Fuller. Each hardcover is signed and ships for $30. Click on the “Add to Cart” button to be redirected to PayPal’s website to complete the payment process. Angola to Zydeco: Louisiana Lives by R. Reese Fuller can be ordered through Amazon and Barnes & Noble and is published by the University Press of Mississippi. Angola to Zydeco is a collection of creative nonfiction pieces about the lively personalities who call south Louisiana home. Originally published in newspapers based in Lafayette – The Times of Acadiana and The Independent Weekly – the twenty-five profiles and features provide intriguing glimpses into the lives of well-known Louisianans such as James Lee Burke, Ernest J. Gaines, Elemore Morgan Jr., Buckwheat Zydeco, Marc Savoy, Boozoo Chavis, Calvin Borel, Santy Runyon, and Eddie Shuler. Author R. Reese Fuller also details the sometimes zany and sometimes tragic subjects that populate the cultural landscape of south Louisiana, from Tabasco peppers to Angola prison to cockfighting. Fuller brings years of experience in the newspaper industry to bear on this collection, offering behind-the-scenes access not available elsewhere. Of particular note are his interviews with musicians and local celebrities, who reveal how their love of the region has influenced their work. Fuller’s natural approach to storytelling creates a book that is a joy to read and truly represents the people of south Louisiana. – Barry Jean Ancelet, Granger & Debaillon/BORSF Endowed Professor of Francophone Studies and Folklore at the University of Louisiana at Lafayette; author of Cajun and Creole Music Makers, Cajun Country, and Cajun and Creole Folktales; and assistant editor of Dictionary of Louisiana French: As Spoken in Cajun, Creole, and American Indian Communities. – Ben Sandmel, musician/producer; folklorist; and author, with photographer Rick Olivier, of Zydeco!